I seem to be in a major learning mode - the stars must be aligned! Love it!!! Since I'm addicted to learning, I've become a very good customer of Craftsy's. I've bought more classes than I have time to do, but since I can watch them anytime, it suits me. 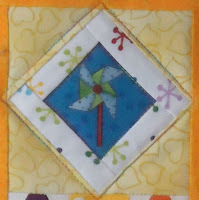 Since I was intrigued by my initial trial of paper piecing in April, I thought I would learn more about it. Of course I can't just follow along with the course. 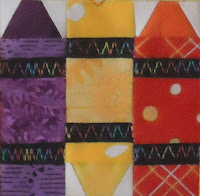 I watched the first four lessons of the Mastering Foundation Paper Piecing with Carol Doak and then went off on my own. In the course resources, there are tons of 3 inch paper piecing blocks to make. I chose three that were fun and that might appeal to my niece and then went to it. My first block was these cute crayons. That was a lot of fun. I got lots of practice since I cut it too small and had no seam allowance left to sew it to anything....oppps! My next piece was the framed picture. I love how it turned out. I then pieced the bird house. How cute is that? I framed all of the blocks and Voila! A wall hanging for Anna. Welcome! 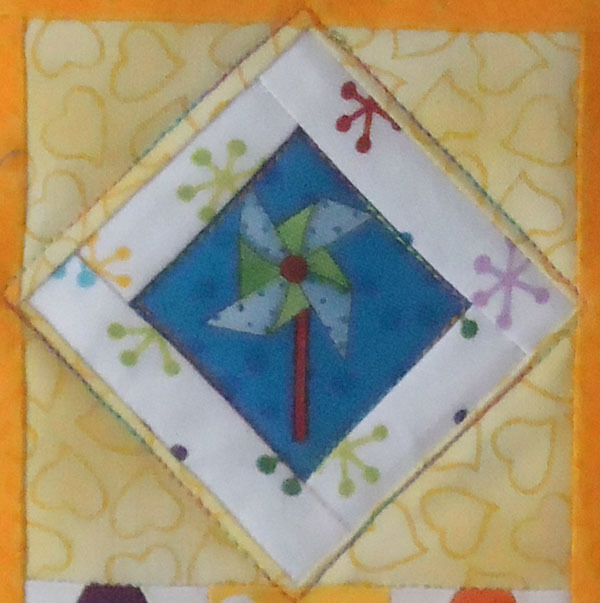 I'm Andrée G. Faubert, the author of Quilting & Learning - What a Combo! I'm first and foremost a learner. 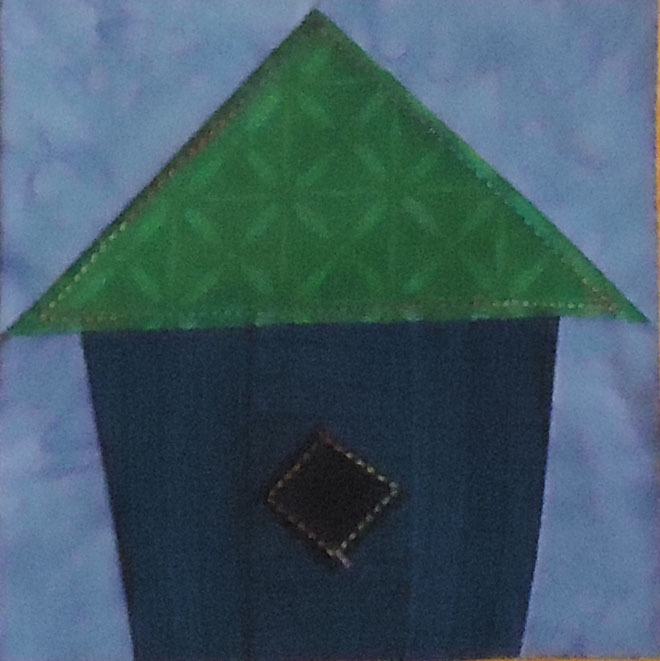 At work, I learn and teach web design and writing for the web, and at home it's all about quilting and art. I love that they come together here; that I can keep learning, reflect on what I've learned and then share it with you. Thanks for joining me on my journey! Join the Free Motion Mavericks link-up! My pattern was published in Make Modern Magazine, Issue 21. Read about the making of the Charming Baby Pattern in this post. Click HERE to view the books, magazines and patterns that I've used for my projects. This includes a link to the resource as well as the related posts. My projects were also featured on Muv's Free Motion Mavericks and Beth's Main Crush Monday! 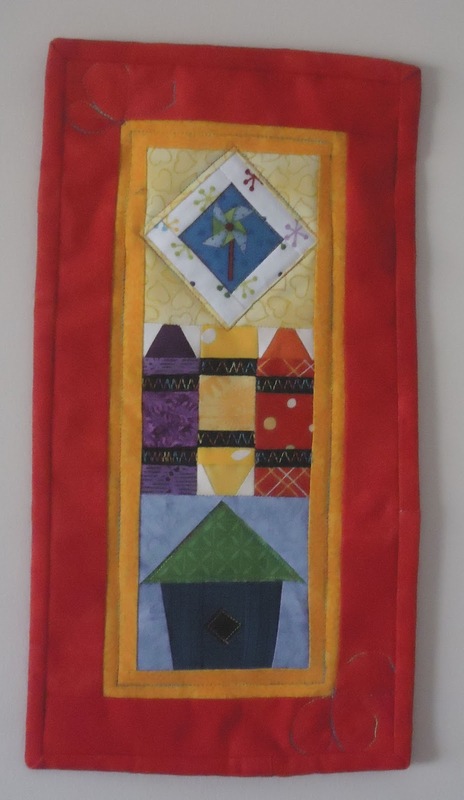 A quilt block of the week - Recalling the fight for women's rights. Background by Tile-able Website Backgrounds. Simple theme. Powered by Blogger.